Last week I went to Orlando for a fun, educational, and motivational gathering of 2000 money nerds. FinCon is a Financial Bloggers Conference where Media and Money meet. It was amazing! 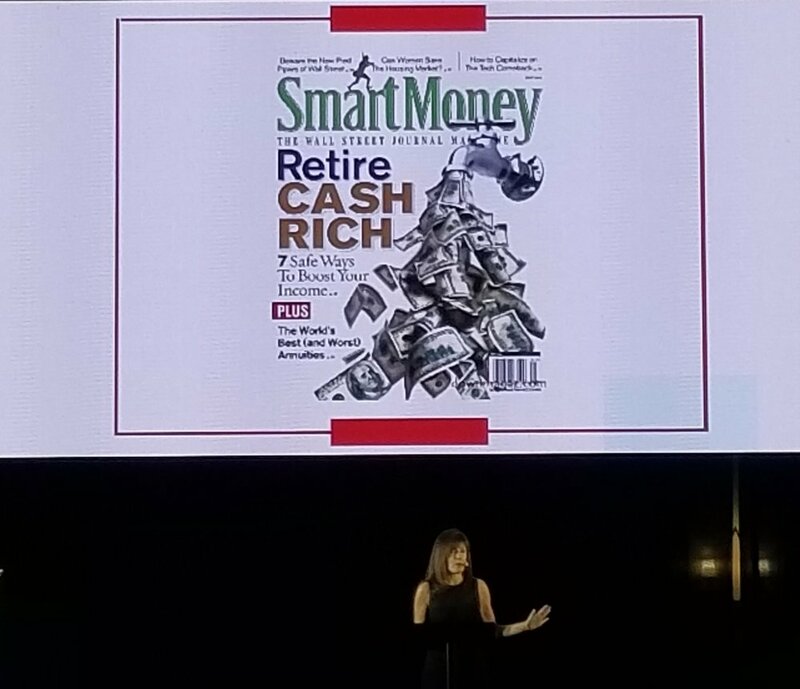 There were podcasters, money coaches (like me), financial bloggers, and so many other financial professionals present. Even though I went last year, it felt like this year was my own personal life changing moment. Here’s why you care… With all the new partnerships that were created I will be able to bring you more services that can dramatically change the way you manage and spend your money. All of this will make it much easier for you to get out of debt, save for your future, and ultimately live the life you truly love. For 13 years now, I have spent most of my time coaching clients about budget and debt elimination strategies. But, I don’t want you to get out of debt just for the sake of doing so. No one cares that you got free of payments. The reason debt elimination is so important is because your future is at stake. There will be 4 million people over the age of 100 in 2050. In 2015 there were only one million. The older population is growing by 17%. That means one day YOU will be old! Simply put, we are living longer, and we need money to take care of ourselves for that long. Social security will not cover all your needs. Your kids are awesome, but they don’t want you sleeping in their guest bedroom for the rest of your life. And travel is so much more fun when you don’t have the debt bills following you home. You need money and lots of it. If you are making payments on debt every month then your ability to save for the amazing future you desire diminishes greatly. 1X your salary saved by age 30. 3X your salary saved by age 40. 6X your salary saved by age 60. This might sound like a tall order. But think about what you could do if debt payments weren’t holding you down. Consider the life you want now and in the future. Do you have the funds needed to enjoy that life without the fear of not having enough? If you want to finally get on a plan and get free of payments, then reach out to me. I’m happy to chat about your options and how I can help you. Set up a time on my calendar to chat. It can be a challenge to navigate your way out of debt. For the most part I subscribe to the snowball method of getting out of debt. But sometimes knowing the right place to begin and understanding how to get out of debt the fastest way possible is a frustrating obstacle to overcome. Check out a few tips I always give my clients who are looking to finally get free in a short amount of time. Stop investing right now. I know this seems impossible and may unwise to some but it really works for 2 reasons. It gives you clear motivation for not remaining in debt for a long time. You don’t want to be out of the market for long periods of time. This also frees up some cash to put towards your debt without changing your budget. Don’t give the government and interest-free loan. So many people love getting tax refunds but what they don’t realize is that they could be using that money in their budget towards their debt every month. Check out irs.gov and use the withholding calculator to determine your optimal exemptions so that you break even on your taxes (you don’t owe, and you don’t get a large refund). Then make the necessary adjustments with payroll so your take-home pay is larger. Finally, apply those extra funds toward your debt. If you received a refund this year then put it to good use and apply it to your debt immediately. Use cash. People always ask me what I mean by this. I mean use cold hard cash for purchases. You will spend 12-15% less when using cash for your groceries, while dining out, and other general shopping. Yes, it is partly psychological, but it works! Use your skills. This is a good time to go to work! We all have gifts and talents that are not being used. Take the time to figure out what you can do after work and on weekends to earn extra cash. The more you make the faster your debt goes away. Finally, use credit to your advantage. If you have good credit and pay interest on your credit cards right now, you may be able to transfer balances to another card with a 0% introductory rate. Check out creditkarma.com and they will show you cards that you could qualify for. Getting out of debt isn’t easy but it is worth it. Do all you can to get free as quickly as possible because then you have the freedom to do anything you want with your money!